Reliable Starting at lower supply voltages and operating temperatures. All 18-125W linear and 8-36W compact lamps covered by one product. The patented LEL Multipulse system produces timed heating followed by high energy, high voltage ignition to give very reliable starting even under conditions of low temperatures. The soft start of UM2 and UM3 give greatly reduced cathode wear and end blackening and therefore significantly enhances lamp life. There is an automatic failed tube cut-off which avoids continuous flashing and ballast overheating. Electronic Starter for twin fluorescent tubes in series, UM3 Multipulse for twin strip lights, operating in series from one ballast and will start tubes in the twin configuration even at -30°C and with a supply voltage down to -10% (both conditions applying together). 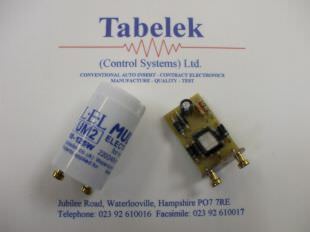 Them UM3 is also suitable for 4W to 22W single circuits on 115 to 240V supplies. Both the UM2 and UM3 are housed in conventional starter canisters. They have an operating life equal to that of a luminaire and can be retrofitted into existing installations of factory fitted into new luminaires. LEL's patented Multipulse circuit used in the UM type starters represents a significant advance in electronic starter performance. Ordinary electronic starters provide for lamp striking with one high voltage pulse each half cycle of the supply frequency. 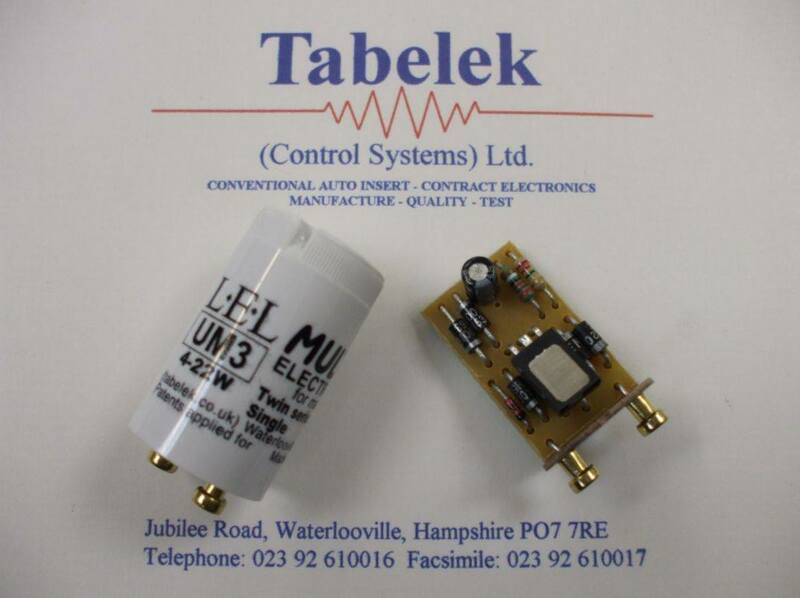 LEL's Multipulse starters provide several high voltage pulses in each half cycle. Under normal conditions a lamp will strike, after heating, on the first pulse received and further pulses are inhibited - so the Multipulse starter provides a positive soft start typical of a single pulse starter. The Multipulse advantage becomes evident under limit conditions of low ambient temperature and low supply voltage. Where those apply the higher energy available from the Multipulse system is far more effective than a single pulse. With 2400mm Krypton lamps (100W) the higher energy Multipulse system is essential for reliable starting below +10°C, and for 1800mm slimline (70W) lamps the Multipulse starter has been shown to overcome problems encountered with ordinary electronic starters in outdoor situations. With all lamps the low temperature and low supply voltage limits are greater than those applying to single pulse types. This also means that heating times can be optimised for normal rather than extreme conditions, thereby providing a faster start. 4-125W, -30°C to +80°C. | 18-65W, -40°C to +80°C. For 4-20W Series Pair and 4-22W Single T5, T8, T12 linear or Compacts. For general use and extreme conditions on twin lamps. Bulk Buy price breaks for electronic starters available.